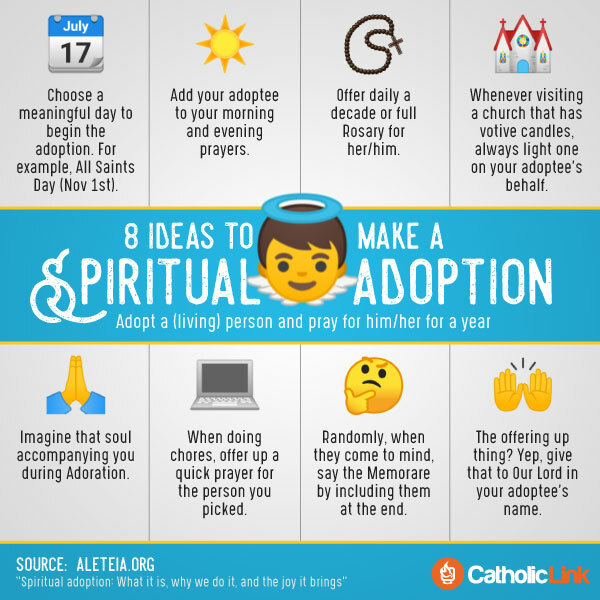 Is there such a thing called spiritual adoption? If it's real, who can do the adoption & who can one pick to adopt? Is it some way to become emotionally attached to a person? What makes spiritual adoption "special" versus ordinary prayers for a specific person? Re: What is spiritual adoption? I know nothing about it, but it says "pray for him for a year". I suppose that's the main difference then: it's a longer commitment than just praying a few prayers for somebody. I'm not sure what you mean by "if it's real." After reading the source article, it seems to me that is was just an idea someone had. There's no spiritual relationship, like there is between a godparent/godchild. While there may not be a formal relationship established, the idea and practice is a very good one. Lord knows we need all the help and prayers we can get. We should do well to pray for our living brethren, as well, especially those close to us.